A dash of Wodehouse is always a great gift idea. This seasonal piece offers a few ideas to help you choose something special for the Wodehouse lover in your life — or for those poor souls of your acquaintance who have yet to discover his healing prose. I often give Wodehouse books to new readers, with mixed results. The trick is to tailor your choice to what Jeeves calls ‘the psychology of the individual’. If you want to start your intended reader on the Jeeves stories, I recommend The Inimitable Jeeves. With the Everyman (Overlook) Library editions making Wodehouse’s lesser known works widely available, you needn’t start with Jeeves. If your intended recipient is a fan of detective stories, Wodehouse’s world is full of shady activities, from impersonation through to pig-napping. Why not start them off with Sam the Sudden, or Piccadilly Jim? Or the first Blandings novel, Something Fresh — it’s a particular favourite of mine, now available in a special 100th Anniversary edition. For romance with a female central character, try The Adventures of Sally or French Leave. For sports enthusiasts, try Wodehouse on golf in The Clicking of Cuthbert, or cricket in Wodehouse at the Wicket (compiled by Murray Hedgcock). The task of collecting and reading your way through the published works of Wodehouse has never been easier, thanks to the aforementioned Everyman’s Library. If money is no object you can complete the set very quickly, but acquiring Wodehouse in smaller bites over a longer period allows readers to savour the pleasures of anticipating and enjoying each book on its own merits. It also allows friends and family to contribute with gifts they know will be appreciated. To avoid duplication, keep a list of the titles you already have. Try this list of the Everyman editions as a starting point. For serious enthusiasts, including those who have collected all the Wodehouse they can get their hands on, there are other ways to bring sweetness and light into their lives. Here are a few suggestions. John Dawson and the Globe Reclamation Project team have spent two years researching, transcribing and evaluating material written during Wodehouse’s time at the Globe newspaper. John spoke passionately at the Seattle convention about his quest to uncover more of Wodehouse’s work, and the result is this wealth of ‘new’ Wodehouse material, made available to us all in: P.G. Wodehouse in the Globe Newspaper Volumes 1 & 2 . This is a non-profit undertaking with a discount available to Wodehouse Society members. 2015 also saw the release of N.T.P. Murphy’s The P.G. Wodehouse Miscellany . It’s available in Kindle and Hardcover from Amazon or Kobo ebook (more details below). I’ve found this nifty little volume to be a valuable reference in the few short months since its release, and expect it will quickly establish itself as a ‘must have’ for Wodehouse enthusiasts. Volume 1 of Murphy’s highly regarded A Wodehouse Handbook has been revised and re-released as an ebook, available from Kobo Books . You or your gift recipient will need the Kobo’s e-reader software, which is free to download from their website. The Wodehouse Society (US) Membership costs $25. Have a look at their Regional Chapters page to find your nearest group. The P G Wodehouse Society (UK) Membership costs £22 for a full year (£11 for 6 months if you join between December-February). The society holds meetings and social evenings in London, as well as occasional outings in the other locations. A list of other Wodehouse Societies is available from the UK Society website. For younger readers who may not be ready for their first Wodehouse, I recommend The Wee Free Men by Terry Pratchett (recommended age 10+) or Guards! Guards! for adult readers. Terry Pratchett was a fitting winner of the Bollinger Everyman Wodehouse Prize for Comic Fiction and I’d recommend his books generally to Wodehouse fans. My daughter enjoys the Murder Most Unladylike series by Robin Stevens (Puffin Books recommend for ages 7-12). Set in a 1930s English girls’ boarding school, each book involves the girls in solving a murder. They’re written in an engaging style that doesn’t underestimate young readers’ intelligence, and they provide a good introduction to the period. This should help when your youngster is ready for Wodehouse. The fourth book in the series, Jolly Foul Play, is due out in March 2016. Not all Wodehouse lovers enjoy seeing his work adapted. For those of us who do, some adaptations are difficult to find (the BBC telemovie Heavy Weather is not available on DVD) and others are best avoided. 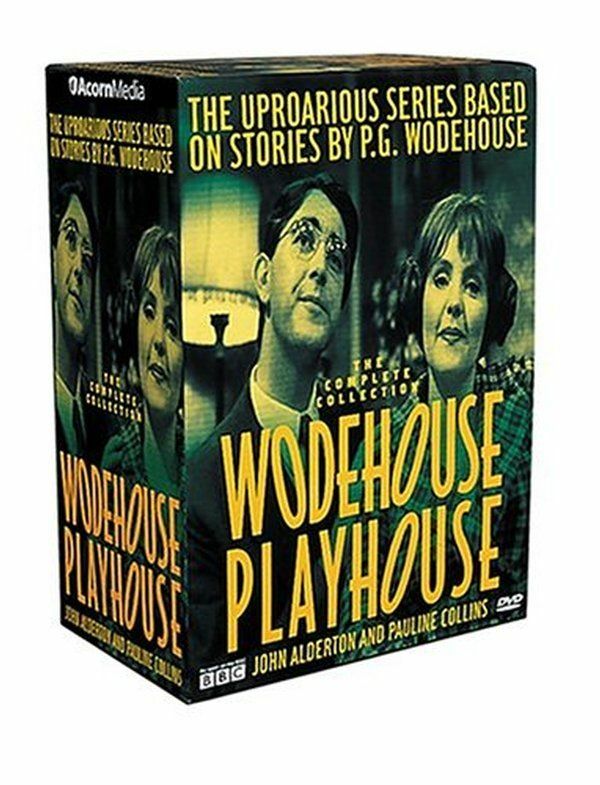 I don’t think you can go wrong with the Wodehouse Playhouse series. P.G. Wodehouse introduces several episodes himself. Another popular adaptation is the Jeeves and Wooster television series starring Hugh Laurie and Stephen Fry. This series introduced many people to the joys of Wodehouse, making it a good choice for Wodehouse fans and new readers alike. I’d also highly recommend adding Wodehouse audiobooks to your collection, or giving them as a gift. There have been various narrators – all good in my view. A Wodehouse audiobook would make a wonderful gift for someone who may be incapacitated, ‘getting on’ in years, or for people with reading difficulties. In the spirit of Plumtopia, I end with another Wodehouse wishlist, from Mr Ashok Bhatia -– A Plum Wish List for Santa this Christmas! — as a reminder of the joy Wodehouse brings to readers all year round. In the case of Wodehouse, that cliché about gifts that keep on giving, really does apply. Thanks for these great ideas, Honoria. Thanks so much, Ashok. Happy Christmas. This truly is a Christmas gift come early! Very thorough and excellent guide for the art of Wodehouse-gift giving, thank you! Ahhhh…. quite. I am more on the silly side than the serious myself. Ah, bliss… I would take issue with one thing, though: no literate child is too young for Wodehouse. I started in at the age of six and I’ve never regretted it. What ho Deborah. You were blessed in that respect. I would like to feel that all modern young readers would be capable of enjoying Wodehouse at such a tender age, but sadly — for various reasons — I fear many are not. Quite apart from reading ability, Wodehouse’s language and style are far more sophisticated than the writing that modern children are generally exposed to (unless their families introduce them to unabridged classics). The result is that it’s too difficult for many of them. And the unfamiliarity of the setting may not instantly appeal — in a world where so much of what they see, hear, read, watch etc is designed to instantly gratify. It is sometimes necessary to do some preliminary spade-work, and build a pathway to Wodehouse through other writers first. Alas! Always good to get kids reading, really, more or less regardless of what they start off with. I agree entirely. Great children’s fiction always makes for great adult reading in my view. The last book in the Tiffany Aching series — I Shall Wear Midnight — is one of his best I think. Golly, true riches indeed! I would add only to your list a CD (oh, all right, a download) of Wodehouse songs. Remember it is not only the centenary of Jeeves and Bertie but also of the Trio of Musical Fame, Wodehouse, Bolton & Kern. Look up The Land Where the Good Songs Go on YouTube and play the version under the cartoon of the crescent moon. The singer is not named but I can tell you it is a New York cabaret artiste named Andrea Marcovicci. Simply sensational. Merry Christmas everybody. Thanks Noel. You are right, and I’m kicking myself — as I wrote in my post Seattle piece about a Maria Jette CD of Wodehouse song making a perfect gift. My list here is incomplete without it so thanks for the correction. And best wishes for a topping Christmas to you too! Hurrah, you’re back! – and what a splendid list of potential presents. Talking of Escoffier – could you take a look at my Anatole post at http://www.moulderslane.wordpress.com – I’m still looking for a suggestion for ‘Benedictins Blancs’. Fabulous idea. I will have a look now. Thanks Victoria. My excellent wife gave me a copy of The P.G. Wodehouse Miscellany by N.T.P Murphy this Christmas. My wife is very helpful in my Wodehouse quest, to read and own all his works. I am getting there and need a bigger bookcase now. Excellent news. My husband bought this for me also, although I already have a copy, which he should have known…. However, I now have one to keep unspoilt and another for thumbing through.